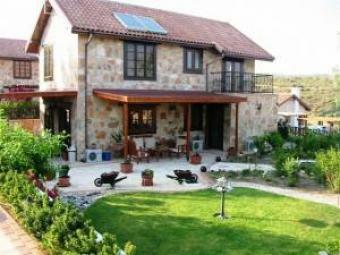 This beautiful well-kept stone villa consists of 3 good sized bedrooms, 2 bathrooms, a fully fitted kitchen, and a stone fireplace in the lounge. It is fully air conditioned and has central heating throughout. The villa also features German made double glazed windows, all with fly screens. On the grounds there is an excellently laid out and well kept garden with a pond and waterfall feature. By the pool there is an outdoor kitchen and B.B.Q area. The property also has a very large double garage. White Goods [electrical kitchen appliances] included. Asking Price: � 450000 o.n.o. Asking Price: � 450,000 o.n.o.